How to enhance the speed of your LAN connection by buying the ideal Ethernet cables | Computer Tech Tips For Everyone! Most people prefer wired connections via Ethernet cables to Wi-Fi connections since wired connections are generally faster with lower latency. Current technology further allows for unbelievably fast speeds when using Ethernet cables. One merely needs to have the appropriate cable for a particular job. If you have bought a router with Ethernet cables recently, you probably realized that most routers are being packed with their own custom cables. This is because manufactures too are realizing that modern communication can be improved by providing the optimum infrastructure. If you procured your routers and cables much earlier, you probably should consider upgrading them. Older strains of Ethernet cables are Cat-5 or Cat-5e. These cables can manage most of your connectivity needs adequately. Nevertheless, our world is rapidly transforming, and speed is now a prime determinant of productivity. 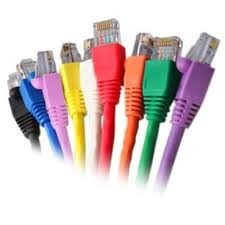 Newer varieties of Ethernet cables are given higher values such as Cat-6, Cat-6a, Cat-7, and Cat-7a. The higher the value given, the faster the speeds that cable provides. Some cables may, however, be too fast form home networks and are primarily developed for institutions and businesses. Cat-5 and Cat-5e (Category 5- enhanced) do not have much difference in terms of structure and functionality. The only appreciable dissimilarity between the two is probably the reduced electrical interference that is associated with Cat-5e cables. The two cables can nonetheless work without raising any noticeable difference in their performance. Cat- 6 and Cat-6a cables are way superior to Cat-5 and Cat-5a. while Cat-5 and Cat-5a can only provide up to 1 Gb/s speeds, Cat-6 and Cat-6a will provide up to 10Gb/s on modern routers and Ethernet-compliant devices. Such is impressive speed but it can only be enjoyed if your devices are compatible and can support such cable connectivity. Cat-6 and Cat-6a cables are thus ideal for home networks where speed is desired. A reliable computer technician can optimize the connections so that the maximum possible speeds are achieved. By now you are probably visualizing how you will go home and rip those Cat-5 and Cat-5e cables from your walls. Nevertheless, there is an issue of cost to consider. With increased speeds and performance, the price of Cat-6 and Cat-6a cables is significantly higher than that of Cat-5 and Cat-5e cables. Therefore, if you do not acutely need fast speeds, Cat-5 and Cat-5e cables will suffice in powering communications in your home. What cable am I using? It is amazing that many folks go on for years having absolutely no clue what cables they are using. It is often not until a computer specialist highlights the need for better Ethernet cables that the issue of what cables are in use comes up. Also, if your internet is bottlenecked, getting high quality cables rarely helps in improving speeds. However, when connecting two or more computers, there is always a roaring difference between when high quality cables are use and when low-quality cables are used. Speak to your computer specialist about the best Ethernet cables for your connections at home.